Before the dust even settled around the whopping Dell/EMC deal, another bombshell was dropped with the Red Hat acquisition of Ansible over the weekend. While I was still processing my thoughts on what I think the Dell deal means for the enterprise IT industry - I had to make an abrupt about-face and think about this poster-child of the community and bottom-up startup approach of Ansible means for the IT industry as a whole, and how this may be an even more substantial win. It's hard not to notice that there's nothing in this deal that tells a clear story on how the new company will transform into the new cloud/web-scale business model. The case for Red Hat/Ansible is the exact antipode of the EMC/Dell deal. 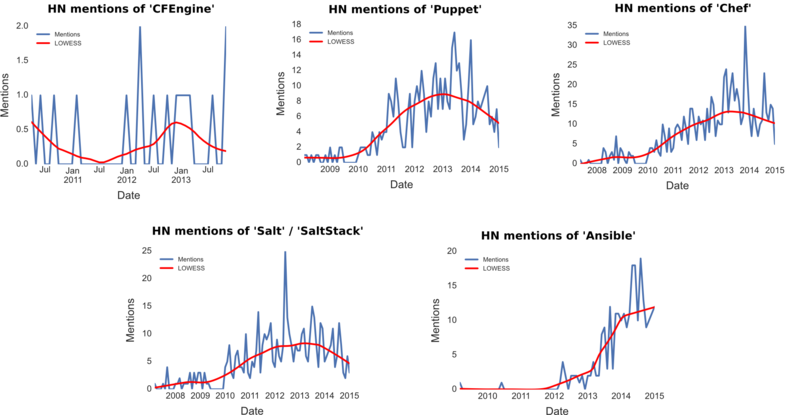 The financial factor didn't really play any real factor at all, what really mattered is the developer mindshare, adoption rate and popularity of Ansible in the DevOps community. The Ansible stats tell the story - plain & simple - high adoption rate, low revenue, and I would add, in essence a high adoption rate at the expense of revenue. The ROI on this deal is a no brainer for Ansible. The rationale for the Red Hat acquisition isn't so much on the direct revenue from Ansible as a product, but rather the potential monetization from its impressive adoption. This is interesting as it clearly put the benchmark for a successful startup these days back on eyeballs and popularity, and less on having a sustainable business model. But this seems to be the new game, and technology companies are all scrambling to get in line with this new model. What's also interesting is that we’re starting to see new companies emerging to disrupt not just the dinosaur of the world, but also the early cloud companies such as Puppet and Chef that are now being disrupted...and there's a long list of such companies. Salesforce is a good example for one that is also being threatened by this rapid disruption. With this in mind Ansible is clearly at its peak right now, so their best option was to be acquired by a bigger company like Red Hat. Red Hat is probably the only company with a sustainable business model around open source, so for them the direct revenue from Ansible isn't that interesting but more of the combined revenue that could be generated by bundling Ansible into a bigger DevOps tool set. I'm sure that the fact that Ansible’s founders are also formerly Red Hat played a not small factor in the overall decision. Steve Jobs’ main mantra was "disrupt yourself before your competitors do" and indeed what's clear in both deals is that change is inevitable, and it can and will happen to big companies just as it can happen to a smaller company. Therefore, the assurance that we used to think we had by relying on big companies isn't a safe bet anymore, similarly the risk of using new technologies from startups isn't as great as it used to be. This is where I see the biggest shift in the value chain specifically in the new data center. The value is less on how we build the tools, but more on how we put them together, and how we can adopt new tools or replace existing ones fast in way that will allow us to always be ready for the next disruption. This explains the rise in orchestration tools, as I pointed out at the last OpenStack Summit, and in my previous post orchestration tool roundup. that plays an important role as a "gluing" mechanism in the area of DevOps and automation. PaaS vs Docker - why is it such a heated debate? Docker started as just a software container on top of a Linux operating system which seemed like a simple optimization for a fat hypervisor. Its disruptive force however comes from the fact that it does force us to rethink many of the layers of the cloud stack. Starting from the way we handle configuration management, through the way we handle networking and build systems, and even microservices. Not all of this is directly related to Docker per se, but that’s the difference between thinking of Docker as a container, and Docker as a change agent or a movement. Aside from Docker’s traditional analogy to the shipping world and how containerization changed the landscape of the maritime world, to me a similar analogy to this is moving from bricks and mortar to glass and metal buildings. You could think of glass and metal as just another form of constructing the same buildings and houses we’ve always had, however the introduction of glass and metal design changed the entire landscape and standard of our former city lives. The fact that with this new approach we can now build entire buildings in a fraction of the time, and rising to a height that is exponentially higher than with the former construction methods, is much more than optimization; it has led to a complete disruption and renewed way of thinking about architecture and design principles. In this way, we can choose to think of Docker as a simple optimization for building PaaS - instead of just using buildpack for shipping our software into a PaaS – since we can now use a Docker images instead right? The problem with that thinking lies in its root - thinking of Docker and containers as yet another software packaging tool is analogous to thinking that glass and metal are just another form of bricks. Anyway the thing that brought me to write about this again is an interesting Twitter thread that developed on the subject over the previous weekend, which was triggered by one of my earlier posts on the subject - Why do I need PaaS if I use Docker? A basic summary of what was discussed is whether Docker can be considered a platform without having supporting services, whether orchestration is the missing link, whether Docker is a viable VM replacement, and if PaaS is just a buzzword or actually constitutes anything on top of IaaS with orchestration implementations on various layers, and what really is the difference between abstraction and automation? So, why is this *such* a heated debate? To understand why is this such a heated debate we need to understand the various players in this discussion, as their perspective is very much influenced by whether you’re a cloud provider, a PaaS provider, an orchestration provider or a container provider. Mapping the different players and their approach to this trend. The most interesting perspective IMO is that of the cloud providers. Cloud providers like Amazon and Google already provide a PaaS: Elastic Beanstalk and GAE, yet in their recent announcements they announced a new offering for orchestration and containers as a service that is not tied to their PaaS offering. Judging by the market reaction it looks like many of the users have been quite enthusiastic and in favor of this new offering. That puts them in a much more pragmatic and unbiased position to basically offer containerization as part of their PaaS offering, or as a new service as long as it meets their users demand and thus drives more utilization onto their infrastructure. The fact that they decided to offer orchestration as an independent service and not an extension to their PaaS offering is IMO the strongest validation that this is probably the approach that best meets the user’s needs. PaaS providers on the other hand are making a good amount of money selling PaaS platforms and services. It is, therefore, clear that when they approach this question that they are biased, by definition. They view Docker as a threat and as a result are trying to minimize its real value, and position it as a natural evolution of their existing platform. Their strategy is to declare support for Docker as an underlying container. They would also offer the option to use containers as the packaging format for applications similar to buildpack. OpenShift from Red Hat have taken even another step in this direction and are planning to switch their underlying orchestration engine to Kubernetes. To me, all this is a fine progression but the main question that still remains open is whether PaaS is indeed the right tool for handling more complex application workloads? This opened up another interesting question - is there enough value left for PaaS if we can use containers with orchestration (the most obvious being Docker orchestration) as an automation and management tool? That question sparked an interesting debate which I found to be fairly surprising as it seemed to reflect what I view as a bit of a narrow PaaS-centric view by many of the PaaS providers who fail to realize that there is more than one approach to managing applications rather than just putting a container abstraction on top of my apps. What is the difference between PaaS (abstraction) and orchestration (automation)? Both PaaS and orchestration aim to solve the complexity challenge of deploying and managing apps. Having said that there there is a fundamental difference between the two approaches, let me explain. Takes an abstraction approach, with abstraction we’re basically hiding complexity by exposing a simpler interface. That approach also comes with an opinionated architecture i.e. in order to provide a simple interface, applications need to be built and written in a certain way that fits the assumptions behind the design of that platform. In the case of PaaS you don’t have much control over many of the operational aspects associated with managing your application, for example the way it handles scaling, high availability, performance, monitoring, logging, updates. There is also a much stronger dependency on the platform provider in the choice of language and stack. Of course, some of these are open source and provide a range of plug-ins that allow some degree of extensibility, but at the end of the day you still have to make sure that this fits with the core design of the platform. The main advantage with this approach is that as long as the app fits into the PaaS design principles, you do get a simple way to deploy applications without worrying about the operational aspects. It’s also much simpler to guarantee the behavior of your applications once they have been deployed. With automation we’re basically taking the same steps that we would have performed manually, and scripting them. By scripting them, we’re achieving a similar outcome, i.e. we can run a complex processes such as application deployment in one command, however the fact that the end result may be similar doesn’t make the two approaches the same as is often argued, let me explain. Kind of like the end doesn’t justify the means, but more to the effect of - the end doesn’t necessarily account for the means. With automation we run a script, and as such we can actually read the script, and quite often understand the underlying steps that will be executed when we run it. As those steps will often follow the same steps that we would do ourselves, it’s also easier to follow up on these steps and retrace them for troubleshooting purposes. All this is fine, but that’s not the main difference. A script is something that can be shared, cloned, modified or rewritten completely so the degree of control and flexibility is significantly higher than with that of a PaaS/abstraction approach. That flexibility also comes with a cost. With automation / scripting it’s much harder to guarantee portability and the behavior of an application, as it often relies on many external dependencies that can break at any given point in time. So in the end, we may still end up with too much complexity. (Unfortunately, the usual tradeoff for flexibility is complexity when it comes to technology). So to put it in @nukemberg’s terms : The difference between PaaS and Automation/Orchestration can be summed up as Magic vs Black Magic. This is where the combination of containers and automation becomes handy. Containers allow us to strike a better balance when it comes to the degree of control vs. simplicity. Containers allow us to reduce the complexity, which is a result of the number of moving parts and dependencies. The right balance in this way is to use automation mostly to handle the dependencies between services and tiers of applications, handle policies such as scaling and failover, and less so how to install software and configure it on RHL, Ubuntu, Windows or whatever environment. Both PaaS and orchestration/automation and containers shouldn’t be viewed as alternative to one another but rather as complementary stacks, in a very similar way to the way Google and Amazon have approached the same challenge. The diagram below is taken from my previous post on Docker vs. PaaS that outlines how each of the layers are ordered in this new stack. It is important to note that the PaaS box in the diagram refers to the more traditional PaaS implementations i.e. Elastic Beanstalk, Heroku, GAE and such. Both Pivotal/CloudFoundry and Red Hat/OpenShift are building new PaaS versions that will expand into orchestration/containers to support more advanced orchestration and container support. The diagram above illustrates how I believe the new application deployment platform stack would shape up when we add orchestration/automation and containers to the mix. This layered approach enables users to choose which layer of the stack they want to use based on their specific use case. E.g. they can choose a PaaS for use cases where they just want to deploy simple apps and not worry about how their apps are managed, or use automation/orchestration if they want to have more tight control over the operational aspects of their apps. Whether this new stack will be packaged under the same platform is less important for the sake of this discussion. Why is this still disruptive? So if we can put PaaS, automation/orchestration and containers together why is this still disruptive? I think that the answer to that is based on the fact that with the combination of containers, this now allows us to remove a fairly big chunk of the complexity for automating our application deployments. By doing this, the difference in terms of complexity between the use of PaaS/abstraction or the automation/orchestration approach to deploy even a simple application has narrowed significantly. I, therefore, think that given those two options, most users would prefer to use an approach that is simple enough but does leave them with a higher degree of control. Because of all this, I expect that we will see a much wider and broader adoption of containers/orchestration to manage apps, rather than PaaS. Do I Need PaaS if I Use Docker? In my recent post on OpenStack “Do I Need OpenStack if I Use Docker?” I covered the confusion that has emerged around one area of disruption that Docker has created. In this post, I’d like to segue into another similar topic that has emerged around the same concept where I sense similar disruption and confusion: the use of PaaS in its traditional form vs using a straight Docker approach. PaaS in its simplest form is a platform that enables developers to develop and deploy web applications into production fast by abstracting many details of the underlying infrastructure, whereas Docker provides a generic container for packaging software stacks in a portable way. The introduction of Docker as a simple abstraction to containers, has turned Docker into a portable software container that isn’t tied to a specific language or framework. It can not only be used as a web container, but also as a more general purpose software container for all sorts of applications such as microservices, big data analytics, stream processing, as well as legacy applications. Some PaaS implementations, such as CloudFoundry, have already started to offer support for running Docker containers as one of the software components that are supported by the platform. Having said that, PaaS provides a fairly opinionated model for the way we should model and package our applications. Often times, our packaging is too limiting as we start to grow to more scalable models, such as microservices. This causes many users today to question whether there is enough added value in PaaS in order to justify these limitations, when users can simply run their software directly on Docker. can provide a relatively simple way to package, deploy and manage applications in an automated fashion. Unlike the traditional PaaS stack - it doesn’t force a specific opinionated architecture for deploying apps although it does lend itself very nicely into both web applications and microservices architecture. The main promise of PaaS is in the speed of development and simplicity. Traditional PaaS implementations achieve that goal through extreme abstraction of the underlying infrastructure, as well as by promoting an opinionated architecture, which provides a fairly optimized and consistent deployment experience for applications that fit into that model. The combination of the two ultimately does help achieve this promise, but for a fairly limited set of applications. Using Docker coupled with orchestration as an alternative provides a more general purpose platform for achieving a similar goal. Unlike the traditional PaaS approach, this use of Docker with an orchestration engine does expose the user to more knobs and infrastructure details, which makes the user experience for developing and deploying simple web apps more complex than with the PaaS alternative, however it does provide the added benefit of flexibility - like with the onset of OpenStack, and open source cloud in general.. In my opinion, the right way to think of the two is in a layered approach in which both the PaaS containers and Docker fit together as outlined in the diagram below. As seen in the diagram above, PaaS becomes one use case for deploying simple web apps. For more complex application deployments, it makes more sense to use Docker directly. In this context orchestration becomes a central piece for managing both use cases. Orchestration also provides a layer of abstraction between the application components and the underlying infrastructure. The important realization is that in this context the role of PaaS as we know it becomes more of a niche role, yet still remains a fairly common and important use case. It is also important to note that the two models are not mutually exclusive. An application that runs on a PaaS container could interact with services that are managed directly through a Docker container, just as you would use other cloud services such as database as a service, load balancer as a service or any other on-demand resource. Another important note is that the combination of Docker and orchestration opens a new path to manage dynamic workloads not just on an IaaS environment, but also directly on bare metal. I’m starting to see more use cases where this option becomes more popular, specifically for managing dev and testing environments where the use of a full blown cloud infrastructure may just be overkill. When we started the journey into the cloud world a few years ago, the underlying cloud infrastructure was very complicated. As a result, the only way possible to simplify the application deployment experience was to take extreme measures in the level of abstraction, as well as by forcing an opinionated architecture to ensure that the application fits into typical cloud architecture. As the underlying infrastructure and tooling evolves, those extreme measures are no longer needed for all use cases. What we’re now seeing is basically a shift of of pieces in the PaaS architecture that was previously embedded within the "PaaS Box" such as containers and orchestration that have becomes more generic, along with independent services that have their own right to exist. The good news in all this, is that as users we are finally beginning to receive the simplicity of PaaS, that was previously limited only to greenfield web applications, for use with a much broader spectrum of applications and architecture styles. So to answer the question from the opening note, do i need PaaS if i use Docker? The answer is, yes. It makes sense to have the two combined, but the role of PaaS as we know it has narrowed down significantly. OpenStack Icehouse, the Ninth OpenStack Release, was announced at at the last summit and was named for a street in Hong Kong. The Icehouse release is primarily focused on stability and maturity. The release marks another milestone in the growth of the project. Just a few stats. Approximately 350 new features added. 2,902 bug fixes were added in the Icehouse release cycle. In this post I’m going to focus on the updates in the OpenStack Heat project, which is a.k.a OpenStack Orchestration. For a general overview on the Icehouse release I would recommend checking out the OpenStack Icehouse release notes or this article by InfoQ. The Heat project started as a clone of Amazon CloudFormation which is basically a declarative approach to automate the infrastructure set up on Amazon environments. The Icehouse release marks an evolution of the project up the stack. If in previous releases Heat was mainly used to orchestrate the OpenStack infrastructure, with Icehouse it has added many more capabilities to handle orchestration of the software stack as part of the application boot process. This shift is reflected in the new HOT template format which allows you to describe a broader aspect of an application configuration including the new OS::Heat::ScalingPolicy. With the Icehouse release these HOT Templates have become the recommended approach. In addition, there is an ongoing effort to introduce TOSCA (Topology and Orchestration for Cloud Applications) into Heat, which is an OASIS-led standard. A new TOSCA translator project for Heat is now part of StackForge. A preview of the TOSCA simple profile can be found here supported by IBM, GigaSpaces, Huawei, Vnomic a preview version of a TOSCA-based Orchestration project for OpenStack is available with the new Cloudify 3.0 project. Other updates include new the Trust-based security model that will allow the delegation of user roles and permissions without passing Keystone tokens or credentials. For more information on the new Heat Trust Model see the Steve Hardy post Heat auth model updates - part 1 Trust. In addition, the Icehouse release includes improvements to scalability by allowing the distribution of Heat deployments tasks between multiple Heat engines. Yoram Weinreb a Lead OpenStack Architect from GigaSpaces wrote a detailed example on how you can setup a Heat Icehouse environment on DevStack. What’s interesting with this example is the addition of Neutron orchestration as part of the simple WordPress example. To try out the example with Heat Icehouse follow the steps from Yoram’s post. I will be demonstrating this example at the upcoming OpenStack Design Summit in Atlanta next week in the talk - When Networks Meet Apps. In his book Taste Test, Matt Jaynes compares a few popular configuration management tools such as Chef, Puppet, SaltStack and Ansible. One of the things that has kept me busy lately is how to make the experience of using Cloudify and Chef a smooth and simple experience. We wanted to get to the point where users can run a Chef Server or Agent, install cookbooks and wrap it with Cloudify Application Service in just a few minutes without having to download or install any software. We've launched a new online service that does just that – making Chef on the cloud simple. The way this works is that once you click on the launch button a new server is created on the cloud (HP OpenStack cloud in this specific case). Next we install the Chef-Server using Cloudify on that machine. After 2-3 minutes once the server is up a new interactive shell window is opened. The interactive shell will allow you to interact with the service by invoking a set of custom commands that are listed just below the interactive shell screen. If you want to view the progress and process of deployment you can click on the “Manage Your App” button. You can also click on the “Use Chef” to open the Chef web admin. While we wanted to make the experience simple it was equally important that we wouldn’t take shortcuts in that process for the sake of a demo. To that end, we kept the demo identical to the way you would run things in production. That means that all that is needed to build a similar demo yourself is download Cloudify and follow the same steps in your own environment. Here’s how Cloudify maps specifically to the challenges outlined in Matt’s book. Ease of Installation: Cloudify comes with built-in server provisioning support that works with a wide range of clouds out of the box, namely OpenStack, AWS, Azure, CloudStack, among others. Cloudify also comes with built-in integration with Chef. Cloudify allows you get your Chef Server installed and running on any of the supported clouds. Agent Installation: Cloudify will provision your application machines, install a Chef agent and wire them up with the Chef server. Or, if you choose to run solo, it will allow you to install the agent with the appropriate cookbooks for that service. Ordering: Cloudify allows you to define the dependencies between services and will launch them based on that order. Remote Execution and Updates: Cloudify uses a custom-command abstraction that allows you to execute remote shell scripts on a group of instances that belong to a particular service or to a specific instance in a group. This feature is useful to run maintenance operations, such as snapshot in the case of a database or code push in a continuous deployment model. While improving your deployment experience with Chef is reason enough to use Cloudify, there are other benefits to gain as well. The real long-term benefit of using Cloudify is to manage post deployment through built-in management, logging and monitoring capabilities, as well as the built-in workflow for automating failover and auto-scaling processes. To learn more on how Cloudify works and how you can build your own Cloudify/Chef service see the Cloudify Chef integration documentation. The upcoming release of Cloudify (currently in Beta) includes further enhancements - specifically the support of Yaml/TOSCA-based configuration. Using Python to reduce the agent and server footprint, allows custom workflow setup to allow users to add their own set of rules to automate upgrades, fail-over and scaling processes, enhanced monitoring and many other goodies, so stay tuned for further updates shortly.. If you're a Chef or Cloudify user, please share your experience with me with this new service and, more importantly, let me know if there are areas where we can do even better. I would be most appreciative of your feedback.